You get an initial page with menus and a toolbar at the top. As you select operations from the menus, notice that there are usually keyboard shortcuts which can alternatively be used to access the menu functions. Look at the page and you will see that it contains a title-block. When drawing a schematic, it's a good idea to always start by setting some schematic boundaries to draw within. This is why the title-block is added every time you start gschem to create a new schematic. Use keyboard shortcut Z to zoom in and Shift+Z to zoom out (or select from menu View→Zoom In or View→Zoom Out). Notice that as you press a key or a key sequence it is displayed in the status bar at the bottom. Notice also that as you zoom in or zoom out the viewable area centers around the mouse cursor. Roll the mouse wheel first without and then with pressing one of the keys Shift or Control to see how to zoom or pan the page. With the mouse in the gschem drawing area, hit the keys VE (or select from menu View→Zoom Extents) to zoom the view to the title-block symbol extents. Zoom the page to see the whole title-block. Position the mouse pointer at the bottom left of the title-block, then press the left mouse button and drag the mouse to select it. Hit the E Shift+L shortcut (or select Edit→Unlock from menu) to unlock and D or Delete to delete the title-block. Bring up the Select Component window by selecting from the menu Add→Component or hit keyboard shortcut I. Or you could click the add component icon on the toolbar ( ). In the Libraries list, select Titleblocks (generic). Left click on the little triangle at the left or just double click the library name to open its component list. Move the mouse onto the gschem drawing area and place the title-block symbol by clicking the left mouse button. Then click the right mouse button to abort adding more title-block symbols. Back in the select components window, (bring it up again if you closed it), select the Basic devices library and then select the component resistor-1.sym and place a couple of resistors on the schematic with the left mouse button. Right click to abort adding more resistors. Left click on one of the resistors to select it. Notice that it is now an orange color and that indicates it is selected. Left click again anywhere to deselect it. Alternate left clicking on both resistors to select them, but notice that if you don't hit the resistor just right, the title-block is selected instead. We really don't want to ever select the title-block again, so we can lock it to prevent its irritating selection: click so the title-block IS selected, then select Edit→Lock or hit keyboard shortcut EL. Now it's easier to select the resistors as we like. Move the resistors around with the left mouse button. Select a resistor and then rotate with the ER keys or the Edit→Rotate 90 Mode. Notice that it is rotated around the mouse pointer position. If you rotate from menu you have to define the rotation center position by clicking on it. 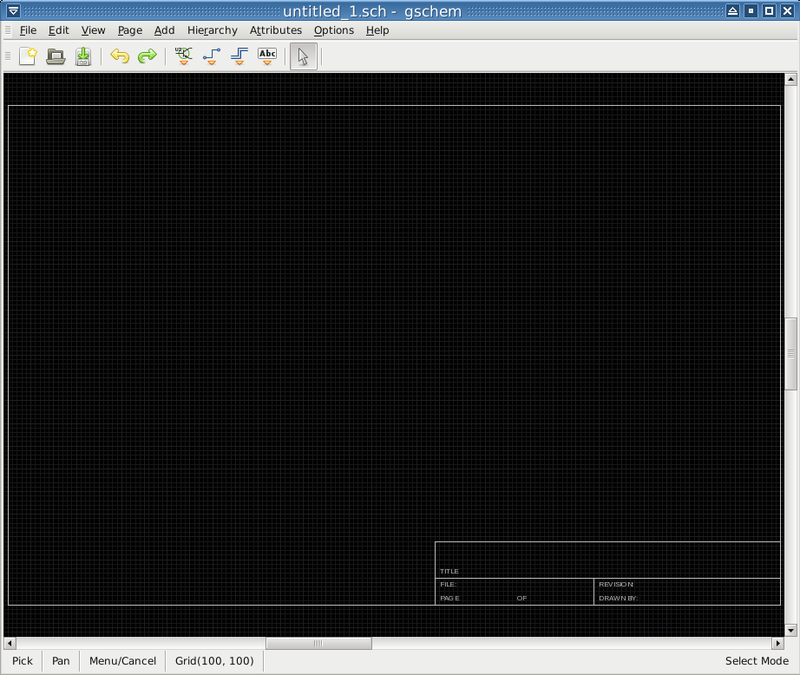 If you don't see where the rotated component is, hit again VE to zoom to the schematic extents. Hit U or Ctrl+Z to undo the last action and Ctrl+Y to redo it again. Move the resistors relatively close together and then zoom in on them. Place the mouse on one of the resistor pins and hit the N key or click the add net icon on the toolbar ( ) to start adding a net. Move the mouse to a pin on the other resistor and you will see a small circle indicating the place the net will snap. The circle is visible only in magnetic mode which is enabled by default. Left click to attach the net to the pin. Move the mouse slightly and you will see a new net following the mouse cursor. Right click to abort adding new nets. Look at the toolbar and see that your mode has switched to adding nets. Before you can change resistor selections again, you will have to re-enter select mode with the S key or by clicking the select toolbar icon ( ) or by using the menu Edit→Select Mode. You will have to play with doing things to get used to the gschem modes. Select the net between the resistors and delete it with the Delete key. Switch again to net mode and try to connect the resistors once more. Select a resistor and hit the EE keys. This will pop up the attribute editing window for the resistor. Here you can change existing attribute values or add new attributes with values to the resistor. Practice well with adding attributes and changing attribute values because you will need to be very familiar with managing attributes when using gschem. Now go back to the tutorial and try working through the simple example there. If you encounter steps that aren't clear, look through the gschem user documentation and attributes documentation. Other gschem documentation can be found on the gEDA Documentation page.